Sol Cayo Guillermo is a 4 star all-inclusive resort situated next to Playa Pilar, one of the most beautiful beaches in the archipelago of Jardines del Rey, facing the second longest barrier reef in the world. It stands out for its romantic atmosphere and well-tended tropical vegetation, which makes it perfect for families, weddings and honeymoons. Guests, also, have access to free Day-Around service in the Meliá Cuba hotels in Cayo Coco and Cayo Guillermo, from 9am to 5pm. 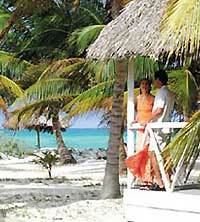 Given its beautiful location, Sol Cayo Guillermo is ideal for fishing and scuba diving fans. Guests can also have fun doing aerobics, participating in ecological excursions all over the keys, playing tennis or in the game room, or simply going to the gym, sauna or massage room. The resort’s pools are also very attractive, since they include pool bar, while the day and night live entertainment is pretty popular among tourists. Apart from that, the resort basically consists of modern and elegant bungalows with spacious terraces. Its bar and restaurants offer good quality cuisine and cocktails, both national and international. Besides, there are nice snacks available during the whole day. Rooms are spacious, cosy and functional, full of light and colours and very comfortable, all of which make them ideal for families. They are located in a truly virginal setting and include terrace or balcony with views of the garden. Besides, they are located in two-storey bungalows while the ones on the ground floor are interconnected. Each one of them is air conditioned and fitted with a TV, telephone, safe and minibar, among others.